in the global market and make clear it's corporate identity, Musashi group established “Global Brand Slogan”. “Power” generated from mobility to “Value”. What we have realized through various products which support automobile critical functions is nothing other than transmitting and converting various types of “power” such as resources and energy to generate “values” beneficial for society. 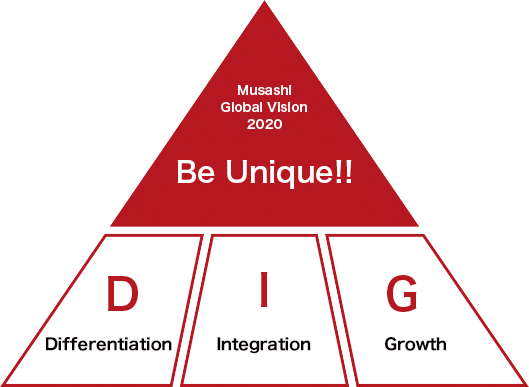 Musashi group will keep pursuing “Power to Value” with our unique technology. It is consistently create differences between ourselves and others, then integrate the defferences into the growth of our company. We aim for "growing" as a company and we aim for "growing" of each of our associate,as well,throngh these activities "We will continue to explore and develop our orignal Monozukuri"
To place value on individual characteristics and diverse ideas; creating differences between ourselves, others and the past. To create new values by integrating all of our efforts with the latest technology. To keep striving to achieve our dreams with a strong determination.